In 2010, 123.3 million people, or 39 percent of the nation’s population lived in counties directly on the shoreline. This population is expected to increase by 8% from 2010 to 2020. If current population trends continue, the already crowded U.S. coast will see population grow from 123 million people to nearly 134 million people by 2020, putting more of the population at increased risk from extreme coastal storms like Sandy and Isaac, which severely damaged infrastructure and property last year. The projection comes from a new report released today from NOAA with input from the U.S. Census Bureau. According to the report, which analyzed data from the 2010 census, 39 percent of the U.S. population is concentrated in counties directly on the shoreline - less than 10 percent of the total U.S. land area excluding Alaska, and that 52 percent of the total population lives in counties that drain to coastal watersheds, less than 20 percent of U.S. land area, excluding Alaska. A coastal watershed is an area in which water, sediments, and dissolved material drain to a common coastal outlet, like a bay or the ocean). 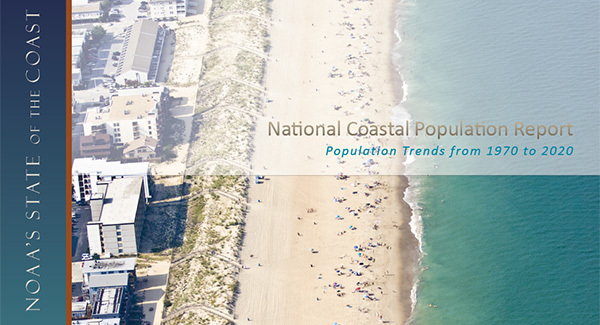 The National Coastal Population Report: Populations Trends from 1970 to 2020, issued in partnership with the U.S. Census Bureau, updates and expands a 2004 report that detailed and projected coastal population trends from 1980 to 2008. This report offers coastal managers and other users, for the first time, two perspectives on population growth along the U.S. coast - the traditional perspective that looks at status and trends throughout counties that drain to coastal watersheds, called Coastal Watershed Counties, and a newer focus that focuses only on those counties that directly border the coast, including the Great Lakes. “Understanding the demographic context of coastal areas is vital for our nation and helps us to meet the challenges of tomorrow. To help inform policymakers and the public through this report, the Census Bureau developed a new measure of coastal populations,” said James Fitzsimmons, assistant chief of the Census Bureau's population division. Coastal population statistics in the overall total of 769 Coastal Watershed Counties provide context for coastal water quality and coastal ecosystem health related issues, and data from the 452 of those counties that lie directly on the shoreline, called Coastal Shoreline Counties, can be used to talk about coastal resilience, coastal hazards, and other ocean-resource dependent issues. The coastal shoreline county data was developed with input from both the U.S. Census Bureau and the Federal Emergency Management Agency. The report also found that from 1970 to 2010, Coastal Shoreline Counties population increased by 39 percent, and Coastal Watershed Counties population increased by 45 percent. The report is available on NOAA’s State of the Coast website, which provides quick facts and more detailed statistics through interactive maps, case studies, and management success stories that highlight what is known about coastal communities, coastal ecosystems, and the coastal economy and about how climate change might impact the coast.